Ceiling fans are a great way to circulate air and cool you and your family down without running the air conditioner (or along with your AC)! Not only that, they don’t take up space and can actually add to your home’s aesthetic appeal. 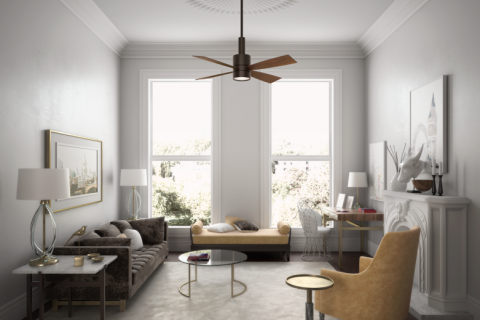 When shopping for a new ceiling fan, it’s important to find one that’s color, material, size, and style complements the design of the room you’re installing it in. It’s also important to consider whether or not you want your ceiling fan to double as a lighting element. One of the first things you’ll want to consider is the size of the ceiling fan. If you’re installing a fan in a smaller room, you want to make sure it’s not too big and if you’re installing a fan in a larger room, you want to make sure it’s not too small. Before you head out to the store, have measurements of room with you. After you have a good idea of what size you would like you fan to be, it’s time to think about what style of fan is going to work with your room’s styling and décor. After you have a style you would like it’s time to think about color, material, and finish. A popular option for a room with a white ceiling where the fan is not meant to be a focal point is solid white. Many ceiling fans have multiple colors and materials like wood and metal. If you’re in a larger room it makes more sense to be bold with your choices, while in a smaller room bold colors and textures may make the room seem smaller than a simple, sleep style would. Lighting in ceiling fans has come a long way. If your room is in need of another light source you may want a ceiling fan with a dome light or one with multiple lighting fixtures. At Hodgson’s Light and Log, we have one of the largest selections of ceiling fans in Kalamazoo. If you’re in the market for a new fan, please come in and see us today!